Over Ryan's spring break week last week, we decided to take a long weekend trip over to Santa Barbara and Solvang. It was so much fun!!! One highlite of our trip: Ostrich Land. It's exactly what it sounds like - a land full of ostriches. You could even feed them (albeit carefully to avoid them biting you). I love the expression on Ryan's face here, it's like he's having a moment with the ostrich. Precious. It was fun to feed them! They also had ostrich eggs you could buy and they were huge! We stopped in Santa Ynez one morning and had this magnificent view. This was on our way to Kalyra Winery where Ryan got to do a fun tasting and we bought a bottle that we can both partake in once the babe is born! And we of course hit up Solvang everyday for fika! We had some great treats everyday, my favorite was this almond-raspberry tart from Olson's Bakery. It was sooooo good. And another major highlight of the trip was going to this grand place: Village Spinning & Weaving Shop in Solvang. 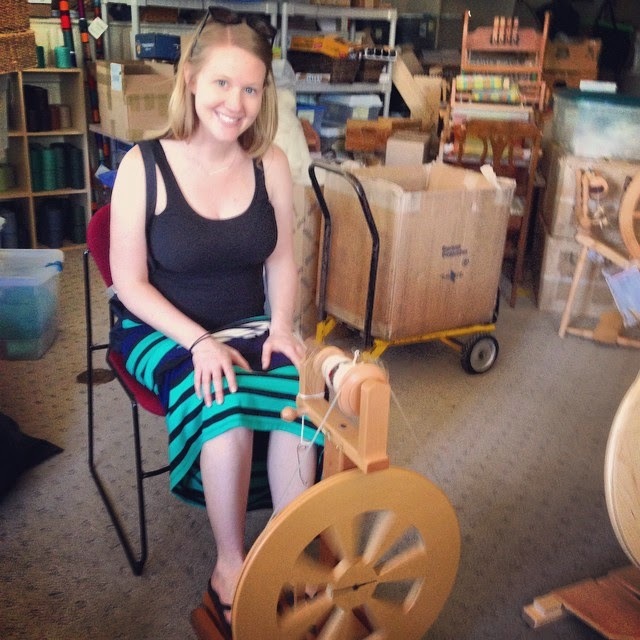 Guess what you guys....I bought my very first spinning wheel!!! This is my trying it out in the shop. I bought an unfinished one, so I need to stain, seal, and assemble it at home. It will be a work in progress, but such a fun one! Goodbye Solvang, thanks for the fun trip! Last weekend I had a wonderful baby shower with family and friends - thank you, everyone! Baby Sterrenberg is so loved already and we feel incredibly blessed to be so supported by so many friends and family. Here are a few photos from the fun day! My super talented sister-in-law made all the adorable decorations (note the Dala horses)! So thankful my mother-in-law was able to come all the way from Texas! Had a delicious Swedish princess cake along with scrumptious brunch food! My little sister, Maren, flew all the way out from Chicago! So much fun to have her! We Skyped in Krista, my older sister in Seattle (we missed you! ), and had to take a sister picture of us all together. My sisters did a bang up job hosting such a fun shower - it was the best! Thanks to all who came and celebrated with us from afar! We are so blessed!